With winter winding down and summer firing up just a couple hours after winter ends, we decided it was time to add more mini-splits. While we were extremely pleased with the first one we put in as regards comfort and energy savings, we had some trouble with it and although we were able to repair it, learned a valuable lesson. That lesson is that “brand matters”. Just in the last month the reversing valve malfunctioned in it and it needs repair again. That is an unusual failure on any quality system and not a cheap fix. I discussed our situation with a highly recommended local AC/Heat contractor and he agreed with our rationale in installing these in this house, and indicated he could repair this one, but the question of “what else” will go wrong with the inferior unit immediately looms its head. As we talked about the units he typically uses and the service record with them (excellent), it became pretty clear that the repair cost is probably not a good investment. Another factor that reared its ugly head…I noticed late in the season last fall that the annoyingly loud and inefficient “window shaker” we use in our current bedroom (the future dining room) at the Old Vic seemed to be a bit balky on startup. Prepping for the hot weather this season (hours away now), I cleaned the filter and coils and fired it up…or rather…attempted to fire it up. It’s not a happy camper and I expect needs a new fan motor. It’s a large number of years old and is not worth the repair cost. Replacement was required and I didn’t want to buy another window unit. While considerably cheaper than a high-end mini-split of the same tonnage (about 1/4th the price) the window units are noisy, don’t take enough of the humidity out of the air, and inefficient/costly to operate. Our climate here has us running AC for 7-8 months of the year so this is a significant consideration. The electricity used in just one season can cost far more than the unit, so investing in efficiency generally has a reasonably fast payout. So…I spent entirely too much money on the Old Vic this weekend. We pulled the trigger and added two more, high-end units. These are 12,000 btu SEER 25 heat-pump units. The size and layout of the Old Vic makes these ideal for comfort, zoning, and energy savings. Based on our experience with the original one, we expect these to pay for themselves in well under 4 years just in utility savings. The comfort value approaches priceless. 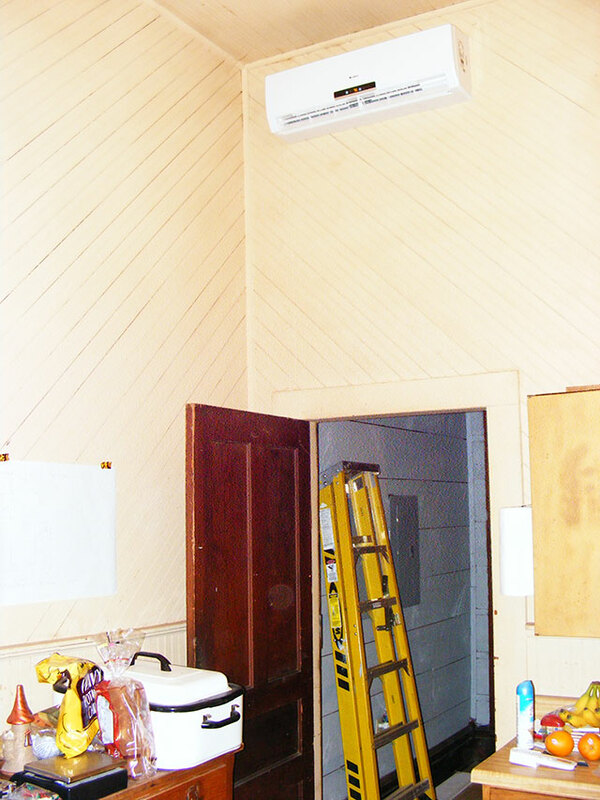 These houses are hard to heat…as the heat rises to the top of the high ceilings…the mini-splits solve that. Mounted up high, they stir/blow the heat down from the ceiling and around the room. The difference in comfort in a room is amazing. When cooling, the high mounted unit grabs the hot/humid air from on high, and cools it, removing much more humidity than a window unit would…and out-does central air in this same task simply because the “intake points” are in each room. The comfort level is amazingly better. The inside unit in the kitchen. The original unit I installed we will replace shortly…I bought it on the ‘net and installed it myself…and while my install was fine, we had trouble with the unit on multiple occasions. 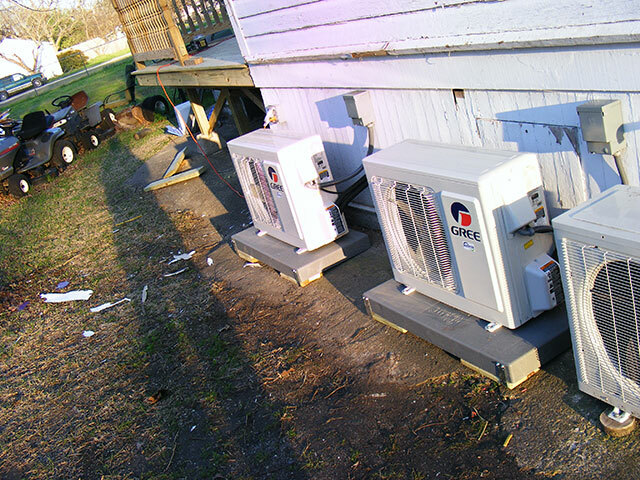 It turns out, for lack of a better description…to be a knock-off unit…and in discussion with my AC guy and looking at how the high-end units run, I’ve decided it’s not worth further repair efforts. The new ones are quieter (and the old one was quiet! ), more efficient, and have a much better warranty and track record. I am disappointed with the old one’s service life, but we did break even with the utility savings so I shouldn’t be too hard on myself for going that route. Turns out though…that I can get the high-end units…INSTALLED…for about the same money of me doing it myself (and much less effort). Lessons learned…and comfort earned for the upcoming summer months.